Image: View inside a NAVSTORS Automated Stowage & Retrieval System compartment with Missile Containers and Ready Service Weapons on MHU-191/M Transport Skids, Omnidirectional Guided Vehicle in position below Robot Stacker on a Payload Carrier. The Naval AUTOMATIC Stowage and Retrieval System, “NAVSTORS,” is capable of accommodating palletized and containerized loads of many different sizes and shapes while, at the same time, improving stowage density and providing selective access to any one of the unit loads contained. NAVSTORS Automated Stowage and Retrieval System (ASRS) employs a unique “moving floor” mechanism, based on a slide-puzzle geometry, to achieve these results. Indeed, this geometry provides the highest possible three-dimensional stowage density of payloads within a given hold or magazine by permitting pallets and containers to be stacked right to the overhead and by eliminating fixed aisles altogether. In a NAVSTORS system, computer-controlled mobile platforms called Payload Carriers are used to transport sets of pallets and containers in stacks weighing as much as 18,000 lbs in a very tightly-nested stowage matrix, and to deliver any one of them, on request, to a high-capacity robotic manipulator at a load/unload station. The Payload Carriers units that comprise the moving floor are driven in X and Y axes and have a low-profile while the fully-open storage space can, if necessary, be accessed by forklift trucks. NAVSTORS ASRS employs a high-capacity, single-axis robotic manipulator to stack and lock down individual pallets and containers onto Payload Carriers for stowage and onto Omnidirectional Guided Vehicles for transport to other locations on the ship. During strikedown, an Omnidirectional Guided Vehicle with a stack of unit loads automatically moves off an elevator into the hold and onto a waiting Payload Carrier. 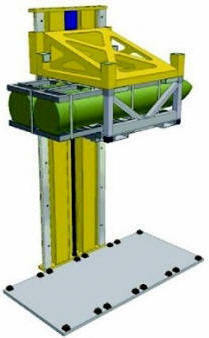 The Payload Carrier then indexes the OGV into position under the robot, which then unlocks and lifts the topmost payload. Next, the moving floor indexes the Payload Carrier carrying the OGV away from the robot and moves a second Payload Carrier, which will be used to stow the unit load for sea, into place under the robot. The load is then lowered and locked onto this second Payload Carrier. When all payloads have been removed from the OGV, the empty vehicle exits the compartment onto the elevator, and a third empty Payload Carrier is indexed under the robot in preparation for the next cycle. This process is reversed during strikeup. High stowage density—no space wasted for fixed aisles and little vertical space lost. Selective offload—any individual payload contained in the stowage system can be advanced from its initial location in the matrix to an unload station adjacent to the lower stage elevator. Payloads are automatically secured for transit at sea even in the worst sea conditions. Ability to accommodate even the longest payloads by moving a number of Payload Carriers together as one unit—singles for pallets and bomb pallets, twins for most air-launched missile containers, triplets for VLS missile containers. Complete stability of payload stacks in even the highest sea states. Ability to pre-stage loads to rapidly remove cargo from the storeroom, and to pre-stage empty Payload Carriers to rapidly accept new cargo arriving for stowage. Agile Systems analyzed the application of NAVSTORS aboard the latest Combat Logistics Force supply ship. Utilizing NAVSTORS in the holds increased stowage capacity up to 42% over a proposed loadout for the ship. Supply ship hold is shown at left with a mixed weapons loadout.